Banana Bread. 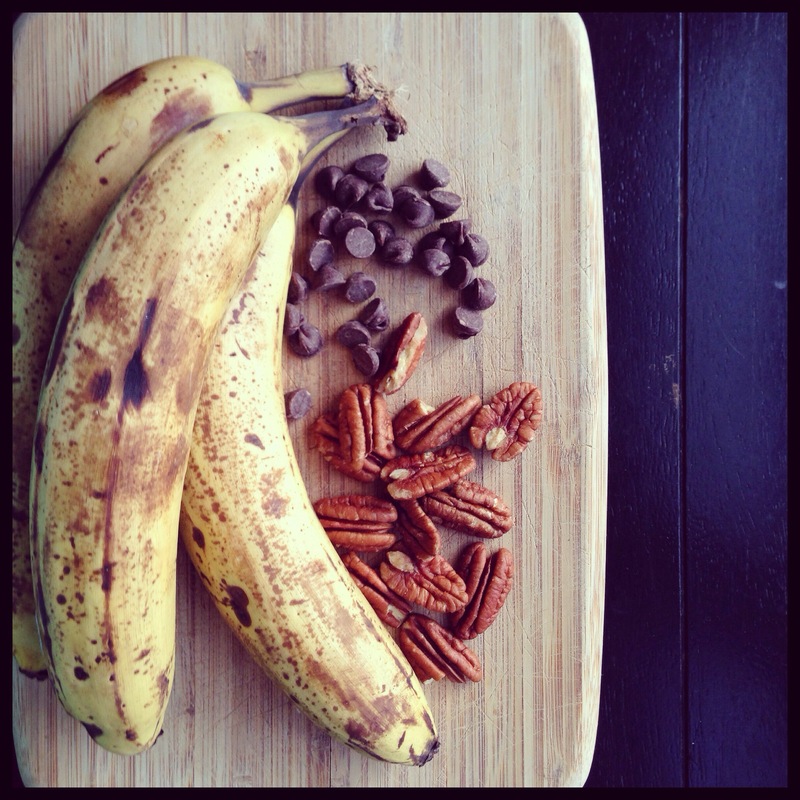 [plus pecans & chocolate chips] | Eat More Plants. I usually end up freezing bananas once they get to that point of no return (almost mushy and brown skinned) to use for smoothies, ice cream and whatnot. This time I actually had a request for banana bread so I went with it, on one condition: I add chocolate chips. 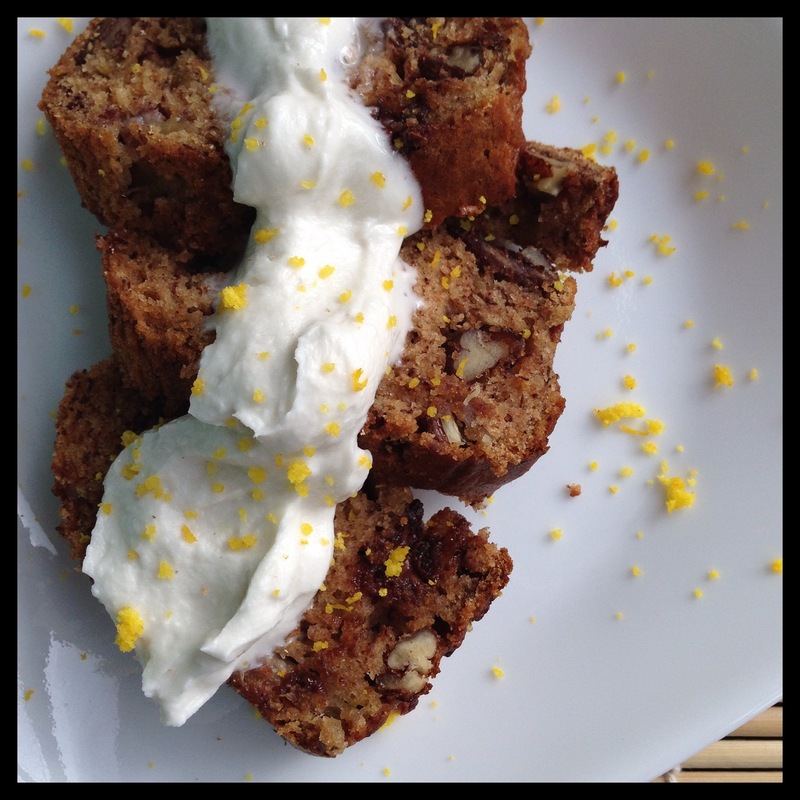 Banana bread is pretty fail proof. Even if you don’t bake often, there’s not much you need to do besides measure, mix and bake. Adding some extras can make it suitable for your own taste; I always add fresh grated nutmeg and chopped nuts. Use butter or coconut oil to grease a 4×8 loaf pan or a bundt pan of similar volume. Mix in butter, sugar and soy milk/vinegar combination. Sift flour with baking powder into a large mixing bowl. Stir cinnamon, nutmeg, cloves (if using) and salt into flour mixture to combine evenly. Mix any extras in now; I added 1/4 c chocolate chips and 1/3 c chopped pecans. Bake at 350 for 45-65 minutes. Check for doneness by inserting a toothpick and checking to see if it comes out clean. If there is batter stuck to the toothpick, keep baking! I whipped together 1/2 c of coconut cream (what you get when you leave a can of full fat coconut milk in the fridge overnight, the thick cream will rise to the top) and 1 tablespoon of maple syrup. Just to have a creamy glaze if you want. It’s a nice addition but not necessary in the least. Also some added orange zest never hurts! I love banana bread! Though I am not a fan of non-dairy butter (or regular butter for that matter) and usually substitute with unsweetened applesauce. Have you ever tried that switch? Oh wait, I realized I didn’t answer your question, lol. I usually sub applesauce for oil in recipes, I’ve never tried to use it in place of butter!